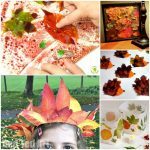 Make some colorful window decor with your kids. 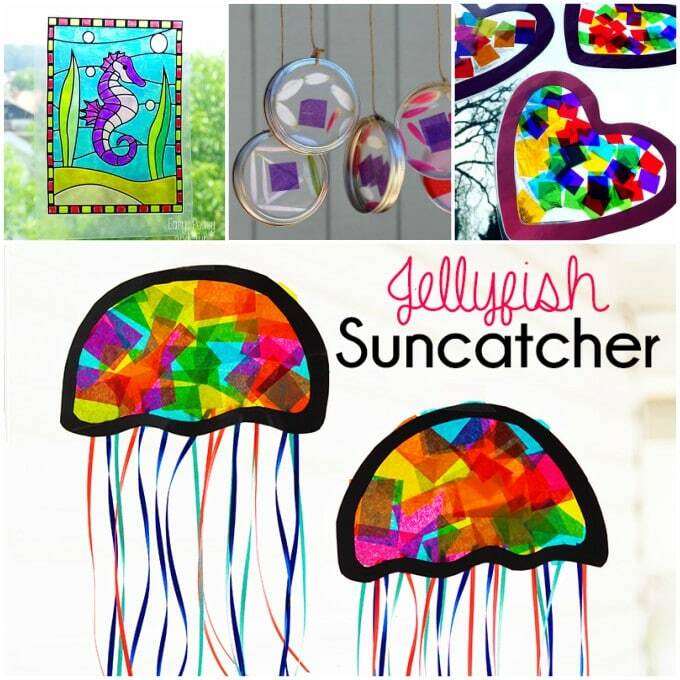 These gorgeous suncatcher crafts will look lovely hanging on your windows and sliding glass doors. And the great thing about suncatchers, if you’re new to them, is that once you learn the technique (with tissue paper, crayons and other materials), you can easily adjust the signs for each season. Nature Suncatcher Windchimes – Make these for each season! 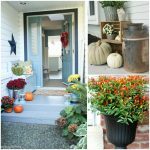 Use flowers, leaves, grass, seeds and more to create nature wind chimes to hang on your front porch. Star Suncatcher – Star windchimes in red, white and blue are the perfect way to show your patriotism on Memorial Day or the 4th of July. Make them in other colors for some star-spangled fun any time of year. 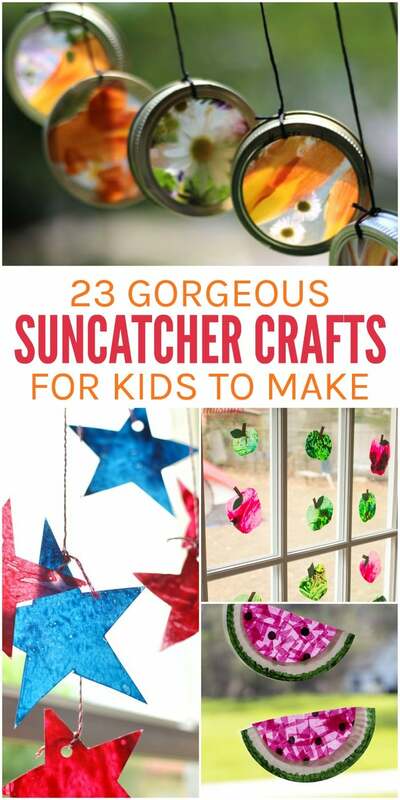 Apple Suncatcher – These are fun to make in the fall when the kids are headed back to school. Watermelon Suncatchers – What a great craft idea for summer! You’ll also want to try our watermelon paper plate craft while you’re at it. 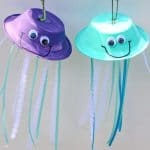 Jellyfish Suncatcher – Aren’t these gorgeous? These are made with tissue paper and ribbons, but if you’re out of ribbon, try yarn or strips of paper instead. Seahorse Suncatcher – This is lovely for summertime or when you’re studying sea animals with the kids. Heart Suncatcher – Make some around Valentine’s Day or any day you want to show someone a little extra love. Suncatcher Windchime – These are made with flower petals and tissue paper. Mixed media is so much fun! 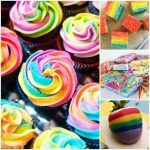 Rainbow Suncatcher – Perfect for springtime or St. Patrick’s Day. Add some cotton at one end to make a cloud! Earth Suncatcher – This is an excellent activity for Earth Day because you can use recyclable materials. 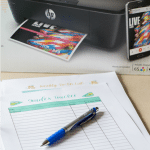 Repurposing is always helpful for the planet. Dragonfly Suncatcher – I don’t know why, but I’ve always loved dragonflies. These suncatchers are beautiful. Suncatcher Mandalas – Such a fun way to study symmetry using materials from nature. 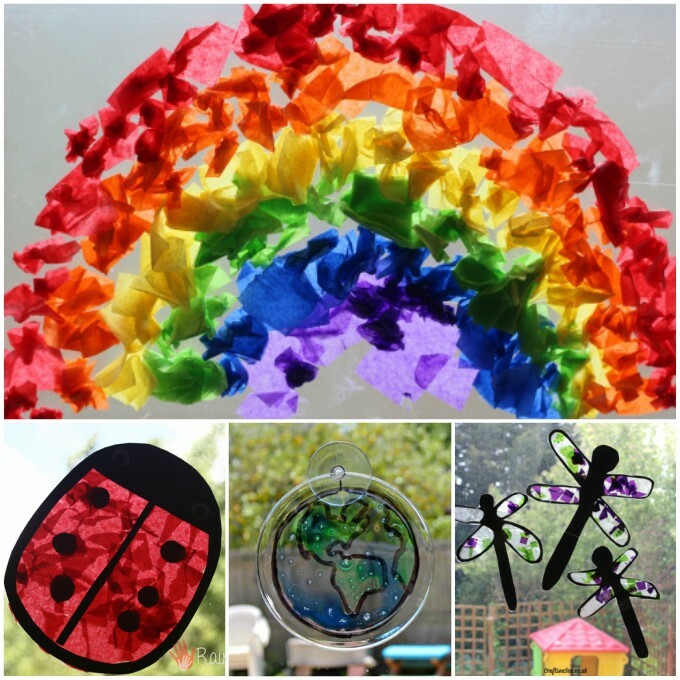 Caterpillar Suncatcher – What a wonderful activity to pair with The Very Hungry Caterpillar book. 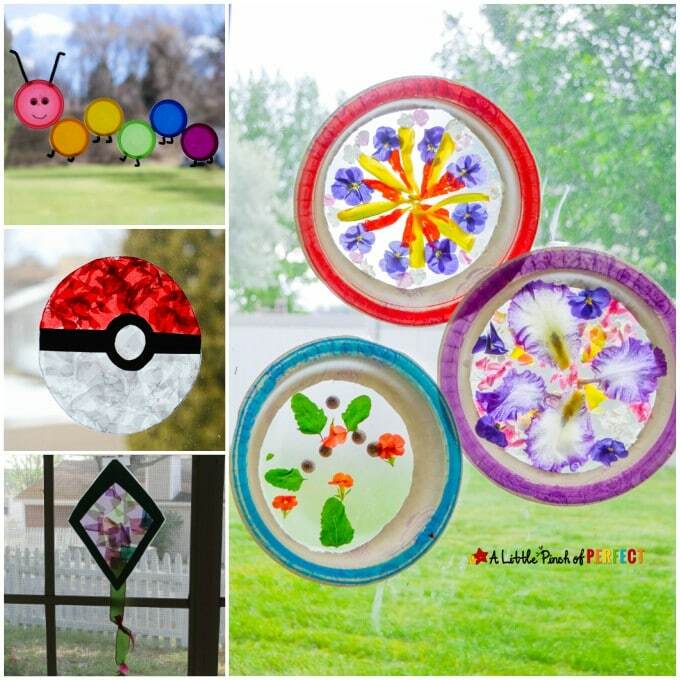 Pokemon Suncatcher – Any Pokemon fan will LOVE this craft! Kite Suncatcher – Another great idea for spring… you could even put it on the window exterior to allow the kite “string” to flap in the wind. 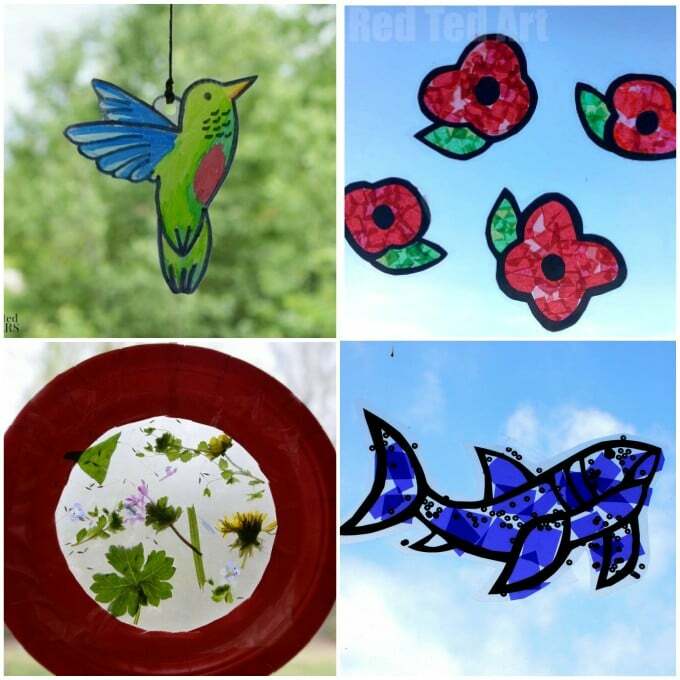 Poppy Suncatchers – Make these for Veteran’s Day. Teach your children about the significance of the poppies in remembrance of those who’ve fought for our country. Shark Suncatcher Craft – A fun way to celebrate shark week or simply a cute craft to pair with an ocean unit. Hummingbird Suncatcher – This is so adorable! And if you don’t want to go to the trouble of cutting out the bird shape, it would look lovely inside a paper plate circle, too. Nature Suncatcher Craft – Use dandelions, clovers, weeds, herbs and anything else you have on hand. Cute! 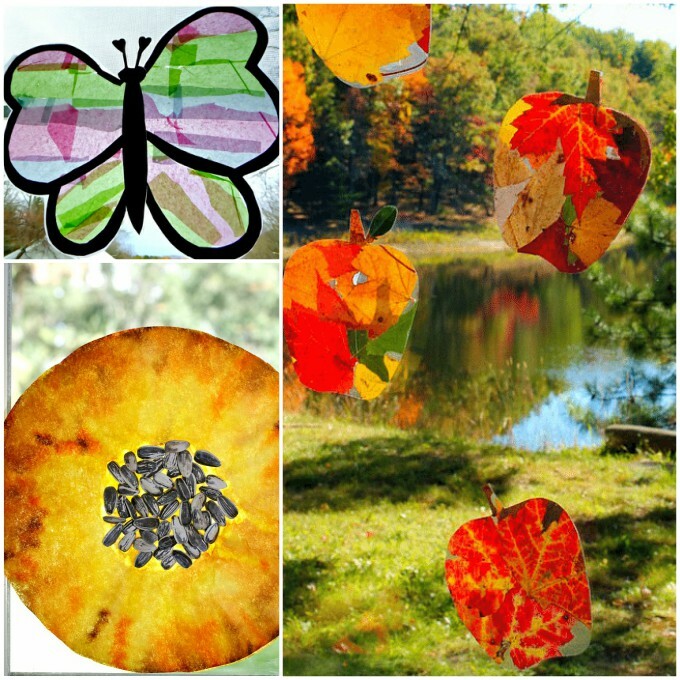 Butterfly Suncatcher – Who doesn’t love a colorful butterfly craft? Sunflower Suncatcher – Add real sunflower seeds to the center of this dyed coffee filter suncatcher. Autumn Leaf Suncatcher – Beautiful and colorful… these leaf apple suncatchers are the perfect way to capture the season.